Animals Count is calling for an end to live transports to Europe and a total ban on hunting. It plans to contest assembly elections in Wales next May. 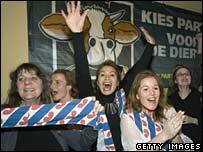 The party is linked to a Dutch one which made history last month by getting two candidates elected as MPs. The party, which held a launch attended by 200 people at Kensington Town Hall, has pledged to avoid the violent tactics often associated with the animal rights movement. Its manifesto will prioritise banning hunting and ending the live transport of animals to Europe. Ms de Boo, 31, said many people may not see the point of her party's stance, but added "soon they will be taking us seriously". She said the main priorities include ending intensive farming systems with poor welfare consequences and ending transportation of animals to continental Europe. She also said her party would like to see an independent scientific inquiry into the validity of animal research and call for a ban, wihout loopholes, on all hunting. BBC political correspondent Norman Smith has said Animals Count could possibly take voters away from the Green Party, potentially splitting the ethical vote. But he said it would be a real "slog" to achieve political representation and this would be time that could be spent lobbying traditional parties on animal rights matters. When this issue arose at a question and answer session, Ms de Boo refused to rule out running against the Green Party in certain constituencies, although she said a formal policy on the matter was yet to be formulated. She added that the party's stance on such issues on "human" issues such as education, public services and the economy were also yet to be fleshed out. Earlier Ms de Boo, told BBC Radio Five Live there were huge numbers of potential supporters. "There are more than 3.3m people in this country who support animal charities every year - they donate about £570m pounds to those charities," she said. "And I think lots of them are disappointed in the current political system. The problem is that animal issues never rise to the top of the agenda of any of the existing political parties." She said candidates would stand at elections for the National Assembly in Wales. "We intend to contest the Welsh Assembly elections in May 2007, and one third of the seats there, 20 seats, are open to proportional representation, so I think it is definitely possible to get an MP in the Welsh Assembly. "Then we will later extend the work into England and Scotland." Marianne Thyme, one of the Party for Animals' two elected MPs, offered some advice to her British counterparts. "People who want to start a party for the animals must not be afraid to be a small group," she said. "They have to realise that they are pioneers and that nine out of 10 will not understand what they are doing but, fortunately, a lot of people don't want to be nine out of 10 anymore."